In the almost regal looking The Monarch of Camden, with its portraits of “nobility” and its assortment of chandeliers and other stately decorations, Missdavinalee prepared to play their set. Prior to coming to the gig, I had had a listen to some of their songs on their Myspace to get a feel for what they sounded like, but I needn’t have bothered. Their Myspace recordings do not do them justice at all; they sound about a bazillion times better live, trust me. Missdavinalee sound a bit like if The Grates, Blondie and The Yeah Yeah Yeahs had a lovechild, that then magically turned into an indie-pop band. Fronted by vocalist and guitarist Davina Lee Cooke, the 5 piece band consists of bassist Roald Madland, keyboard/synth player Angus Wilson, drummer Gareth Ashton and multitalented keyboardist, guitarist and tambourine player, Jenny Green. It is so awesome when you get to see a band with chicks in it that aren’t just vocalists. (No offence to Hayley Williams, Patience Hodgson or Gwen Stefani meant). They started off their set with ‘Shake’ which set off a couple of girls in front of me to start “grooving away”, just a note for future reference, it’s rude to move and start dancing in front of someone that is trying to take a photo! 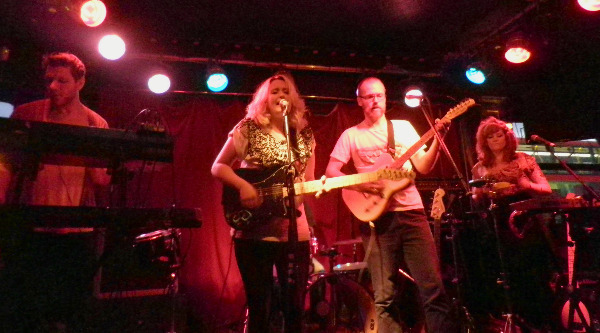 Their second song was my favourite, ‘Numbers’ which is, as Davina Lee Cooke eloquently put it “about… numbers”. Really catchy song, pop hooks and cute lyrics galore! The ballad-like ‘Dreams’ was a bit more mellow, had an awesome bass-line though, you could literally feel the bass thumping in your bones. The poppy-er “Bed Bugs” was another crowd pleaser, as was their soon-to-be-released single ‘Come On!’ which was the last song of the set. You can really tell that this band is going places, the crowd absolutely adored them and when you go see them, you’ll know why. I fully recommend you check these guys out; they have a couple of shows coming up in September to promote the release of their single ‘Come On’ which will be released on the 20th of September and will be available via iTunes and Amazon. Get on it!!! Posted on August 23, 2010, in camden, Music, new music and tagged broccoli events, Broccoli Music, camden, gigjunkie, things to do in camden. Bookmark the permalink. Leave a comment.